OK, so we covered how to optimise your pages for specific keywords in the previous on-page SEO article. In this second in the series ‘SEO Made Simple’ we look at off-site SEO factors. This means the SEO activities we can take on the wider web and not on our website. 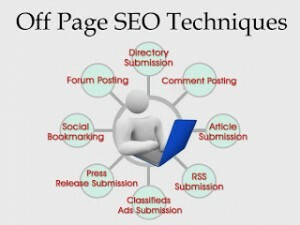 The main element of off-site SEO is links back to your website. These are links from other websites that when clicked open up a page on your website. Link quality is far more important than link quantity. Now, let me clarify what that means. Hundreds of low quality backlinks to your site won’t be worth as much as a small number from relevant and well-ranked websites. So how do we check if a website is well ranked or relevant? The simple is answer is to look at the Google Page Rank (PR), which is a scale from 0 to 10. The easiest way to do this is to download and install the free Google Toolbar for your browser. From there you can switch on the page rank feature which gives you a little box in the toolbar. When that’s done you can see the page rank for each website page you visit. The main thing about links is that the higher the page rank of the linking website the better. The Google page rank goes up by a factor of ten. A page rank of 1 is ten times more important than 0 and 2 is ten times more important than1. So, to do the maths, you’d need 100 links from a 0 website for each 2 website and so on. It’s a bit more complex than that but in reality but that’s about the gist of it. Either way, you should aim for well ranked sites. Something else to take into account is the content of the site linking back to you. Always try and get links from sites that have content around your subject. So, if your website is about antique teapots, try and get links from other well ranked sites about teapots. A quick and easy way to find relevant and well-ranked sites is to simply put the search terms you’re interested in, such as ‘antique teapots’, into a search engine and examine what comes up. You can click on the first few pages and see what their page rank is on the Google Toolbar. Another useful feature of the Google Toolbar is that when you click on the little down arrow next to the page rank there’s an option called ‘backward links’. Clicking on this will give you a list of websites that link to the site you’ve been looking at. This means that if your competitors are ranking well, you can take a look at where their links are coming from and try and get similar links back to your website. Again, always try and get links from quality sites rather than just any old links. There are loads of different places you can get links back to your website but the key is to build up links consistently over a period of time. You should also try and keep a record of links that you build to track your progress. And finally: link building takes time and should be a part of your long-term website marketing strategy. You probably wouldn’t be able to sit for hours on end each day just building links. Our rule of thumb is to get a minimum of 10 quality links, from a variety of sources, each week. Let us know if you’ve any useful ideas on link building by making a comment below.